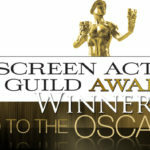 This year’s SAG Awards were held in Los Angeles. Below are the final results. Check out Dallas Buyer’s Club for Matthew McConnaughey and Jared Leto for their acting work, Lupita Nyong’o for 12 Years A Slave, and Cate Blanchett for Blue Jasmine. Looks like McConnaughey might be the one to bear come Oscar night! Awards Season	The 86th Academy Awards – Nominations!